Adel was one of the first "Euros" to appear at Avaloncon and may be showing its age. It fell fromthe Century for the first time with its lowest attendance in 15 years. Semi-Finalists Tom DeMarco, Shea Lawson, Ray Pfeiffer, Mark Geary, and Erica Kirchner pause for a photo op. Three would advance to the Final. The format is the time honored original, still unchanged since its inception. In the first round, every entrant plays four games, scoring points based on finishing position (1st=5 points, 2nd=4, 3rd=3, 4th=2, 5th=1). The ten players with the highest total points advance to the semi-final. Each semi-finalist plays two games, with the four winners and the best second place finisher advancing to a single winner-take-all Final. Among this year's contestants were nine former champions, four spouses of former champions, 15 who played last year, and seven of last year's ten semi-finalists. For the first time this century, there were more four-player (4P) games (16 ea) played than five-player games (12 ea), which affected players' strategies, making using a Detective less profitable and making it easier to be alone at the Auction House or the Castle. Two of the three longest sets at the finish were held by Alex Bove, holding 14(4P) and 13 cards, and with Shea Lawson also finishing a game with 13(4P) cards. After the first set of games there were seven players tied at five points. The first tiebreaker is the number of spaces past the finish line and the second tiebreaker is the longest set. This put 1998 champion Mark Geary in the lead with his finish of nine spaces past the finish line, followed by 2003 Junior champion Tim DeMarco, who finished seven spaces past in his win over former champions John Pack and Richard Irving. The other winners (in order) were Shea Lawson, Erica Kirchner, defending and four-ime champion Ray Pfeifer, 2004 champion Marc Houde (who finish his game without a valid set), and Anne Norton (who had already won two championships in earlier tournaments. Six games were played in the second set of games, with none of the Round 1 winners repeating. The new leader was Tamara Houde, with nine points and 11 total spaces past the finish, followed by Mark G., Shea, and Karl Henning. 1993 champion Tom DeMarco, John, Alex, and Ray, followed with eight points. In the third set of games, Mark used the 8-space bonus in his game for the longest set at game end to tie Sharee Pack at four spaces past the finish, then to win on the tiebreaker, staying in the lead to qualify for the semi-final with 14 points. Next was Alex, John, Ray, and Shea at 13 points, followed by Erica and Karl at 11 points, and Tom, Sharee and James Jordan at 10 points. In Alex's win, four of the five players crossed the finish line on the last turn. There were five games played in the last set. Mark got the four-space bonus at his game end for the second longest set and for the second time in a row pulled up to tie the apparent leader Erica and then win on a tiebreaker to be the highest qualifier at 19 points. Alex also got his third win and became the second qualifier with 18 points. Alex's game had the tightest bunching at the finish, with the fourth place finisher only five spaces behind Alex. They were followed by Ray at 17 points, John and Karl at 16, Erica and Shea at 15, Tom at 14, and Ashley and James at 12 points. Ashley's game had the tightest bunching in a five-player game with Laurel Stokes finishing only seven spaces behind her. James couldn't stay for the semi-finals, so the best tiebreaker among the five players finishing with 11 points would take the final qualifying spot. Greg Crowe finished in his fourth game at 13 spaces past the finish (the maximum possible) was enough to give him the best tiebreaker, allowing him to beat out Sharee, 2000 champion Richard, 1997 champion Thomas Stokes, and Derek Landel to advance to the semi-final. In the first two semi-final games, Karl bested Alex, Ashley, Greg and John, while Ray beat Mark, Tom, Shea and Erica. In the last two semis Alex topped Mark, Erica and Ashley, while Shea vanquished Tom, John and Greg. Mark had the best second-place finish in the semi-finals, making him the last to advance. Tom finished with sixth place laurels and was the only player to ever finish past the finish line in all games played in any single year without winning a single game, finishing second fpur times and third twice. The Final proved anticlimactic, as Mark, with the longest set anchored by the oldest card in the deck (the 1468 "A" card), zoomed ahead to a win at 12 spaces past the finish line, and 16 spaces in front of Karl, who finished second at five spaces short of the finish, followed by Ray (-7 spaces and 10 card set), Alex (-7 spaces and 8 card set) and Shea (-9 spaces). Mark Geary, the 1998 and 2006 Adel Verpflichtet champion, has played in the tournament every year at least since 1998, except for last year, when he attended the World SF convention in Glascow,Scotlandi nstead. Over the past seven years (those I have the records for) he has played 32 games, playing the red position the most (nine times), and Black the fewest (four times). He has won ten times, finished second 11 times, and only finished last twice.. He has finished past the finish line 16 times, has an average of 9.47 cards in his finishing set, and possessed the ultimate tiebreaker card (the 1468 "A" card) eight times. He has gotten the eight-space bonus for the longest set at game end 15 times (47%), the four-space bonus for the second longest set 11 times (34%), and not gotten any bonus only six times (19%). He has made it to the Final in three of the last six times he has entered, twice by having the best second place finish in the semi-final and therefore being the last to advance. Of the 82 different opponents he has faced in the last seven years, he has played Ray Pfeifer the most (seven times), with each winning twice. He has played each of Carolyn, Wendy and Tom DeMarco, and Erica Kirchner four times. Mark's favored strategy is to collect as many cards as possible, in the hope of taking the longest-set bonus to move up for a first or second place finish. 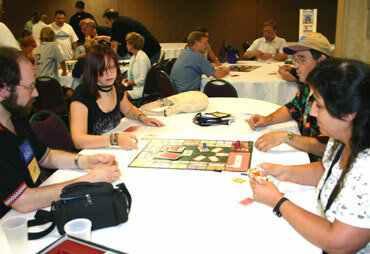 Adel Verpflichtet, By Hook or Crook, Hoity Toity, regardless which edition you prefer, the juniors tournament produced a champion for the 2006 World Boardgaming Championships. Collecting, or acquiring, "art" the players from the Junior tournament proved that they too can race through British manors and display impressive collections. The games had a slow start. We didn't have anyone to sign up until 5 minutes after the game was scheduled to begin. We ended up having 14 children play the game. Three games ran and the winners of each game went on to the final round. The entrants were: Emma Russell, Joshua Weintraub, Mirth Pack, and Kate Lee at the first table; Willow Barbero-Menzel, Sara Powers, Aurora Pack, Annie Frattali, and Morgan Christie at the second table; Kaleigh Jaeger, Rebecca Melton, Caitlin Jaeger, Virginia Melton, and April Gardner at the third table. 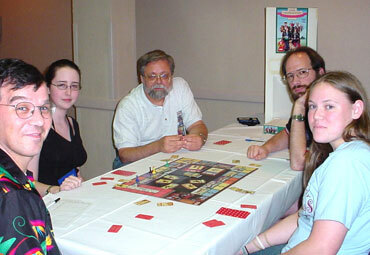 Kaleigh Jaeger, Willow Barbero-Menzel and Emma Russell all won their first games and vied for the title of winner of the 2006 Adel Verpflichtet Jr. game. Throughout the entire final all three girls were close together in moving along the board. Each one was in the "lead" at one time or other. Throughout the game we had only one thief go to jail. There ended up being quite a few multiple collections shown while they were at the 'Schloss'. The final turn had all three in the red section: Kaleigh was three spaces past the end, Emma seven spaces past, and Willow was nine spaces past, giving Willow the win. Both Kaleigh (BBCCDDEE) and Willow (AABBCDEF) ended with a collection of eight cards and Emma (ABCDEEFFF) ended with a collection of nine cards. Willow had the oldest card in the collections at 1468, followed by Kaleigh with a 1616 and Emma with a 1650.